Emily Carmichael at the premiere of Book of Henry. 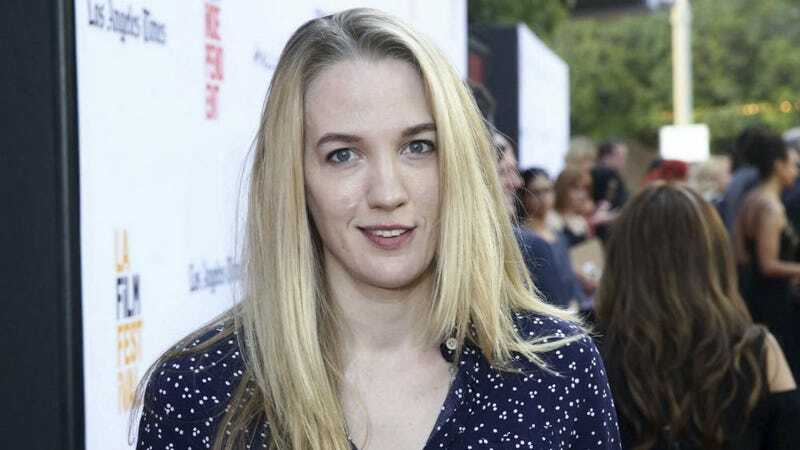 After ten years making short films and working the festival circuit, this weekend will be the first time writer-director Emily Carmichael has a feature film released in theaters. It will not be the last. Carmichael is the co-writer of Pacific Rim Uprising, which opens tomorrow, March 23. She’s already written a remake of The Black Hole for Disney, has the screenplay for Jurassic World 3 on her to-do list, and then she’ll be directing a superhero film produced by Steven Spielberg. It’s a line-up that’s going to put her name alongside Rian Johnson, Duncan Jones, Ava DuVernay, and others, and it took a lot of work to get there. Eon is one of three projects she’s currently working on with Trevorrow and Spielberg, including Jurassic World 3 and Powerhouse, the latter of which she’ll also direct. Developing those projects with Trevorrow and Spielberg may have been her big break, but Carmichael didn’t need another one to land the writing job for Pacific Rim Uprising. A longtime fan of science fiction and adventure who cites The Matrix, Dungeons & Dragons and John Carpenter’s Ghosts of Mars as major influences, when she heard a Pacific Rim sequel was in the works, she went after it hard. The Jaegers of Pacific Rim Uprising. They didn’t. She was hired to be part of director Steven S. DeKnight’s writer’s room, a technique he borrowed from his TV days on Spartacus and Daredevil. Once that group settled on a story and outline, DeKnight selected Carmichael and Kira Snyder to actually write the script. The original script had been focused on the character of Raleigh Beckett, played in the original Pacific Rim by Hunnam, who dropped out to pursue his dream project (you can read more about that here). When John Boyega was brought in to star as an entirely new character, it required another script entirely—this time by T.S. Nowlin—because by then, Carmichael had already moved onto another project. Here’s all the info we have on Jurassic World 3. That and that Emily Carmichael is co-writing. Next up was a gig writing a remake of The Black Hole for Disney. Trevorrow was so impressed with that, as well as with Carmichael’s work on Pacific Rim Uprising, he brought her on to help him write Jurassic World 3. It’s a film Carmichael is incredibly excited about, as evidenced by her pumping fists in the air wildly when I mention the project. Unfortunately, all she can say about it is that she’s seen and loved the second film and that work has just started on the third, which is scheduled for release in June 2021. After a decade in the business, Carmichael doesn’t take it for granted that she’s a woman making major strides in the male-dominated science fiction and fantasy space. At least we’ll definitely be hearing a lot of stories from Carmichael in the years to come. Pacific Rim Uprising opens Friday, March 23.